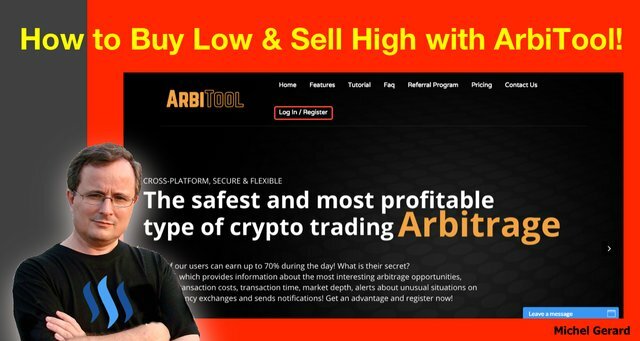 How to Buy Low and Sell High with ArbiTool! Would you like to know about a new tool that can help you decide what cryptocurrency to buy at a low price on one exchange, and then can tell you what other exchange to transfer it to and sell it at a higher price because if you have tried to do crypto arbitrage, this will be very useful for you? Arbitrage is a kind of trading, which is buying low in one exchange, and then selling high in another, making a profit in the process. For example, you could use your BTC to buy ETH on Poloniex, transfer this ETH to Bittrex and sell it back to BTC at a higher price. The difference would be your profit. The tool I am going to show you today is called ArbiTool and after looking at it for a day, I can say that I am very excited with what it can do. I have heard about cryptocurrency arbitrage when I started with Bitcoin two years ago, but without a proper tool it is difficult to do arbitrage trading successfully. You can do arbitrage not only with Bitcoin, but also all the altcoins that are traded in cryptocurrency exchanges and doing it just by comparing data on the websites is time consuming and not practical. If you are interested to check out ArbiTool after reading this tutorial, would you please use the affiliate link below because this will help me pay for the tool and it is at no extra cost to you? I also have free trial coupons and discount coupons for you later in the post. 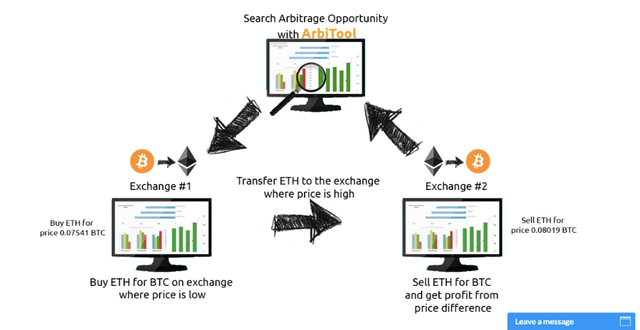 This professional tool for arbitrage scans different cryptocurrency exchanges in search of price differences and shows the user where to buy and where to sell. With the tool you can, for example, see where to buy ETH for 0.07541 BTC on exchange #1, where to transfer the ETH on exchange #2, which is at a higher price, and sell it for 0.08019 BTC. The tool also calculates the profit after taking into account the transaction costs and the cost of transfer, and shows the depth of the market, so you can see what amount can be bought and sold in both exchanges. The tool doesn't have access to your exchange logins and it's perfectly safe to use it, only data is presented to you, so you can make the right decisions in your arbitrage trading. You will understand everything after reading further. 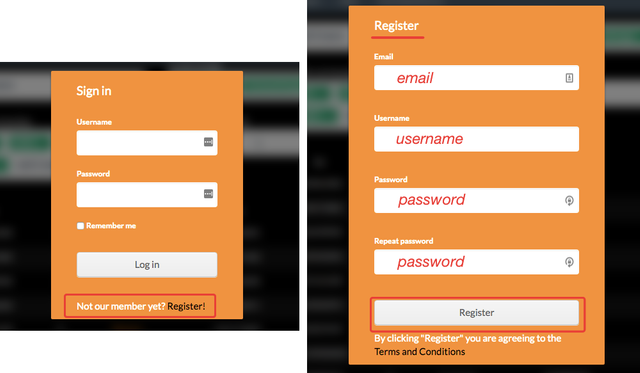 All you need is an email and a username, plus a strong password, for the "Register" form at the right. If you need to login, you can do so from the home page. After you have registered you will be directed to the dashboard indicating that the user has been created successfully. With the free account, the arbitrage opportunities are limited to 1.25%, but this can get you started with the tool and your first arbitrage. Then, go to the "Account" menu and click on "Get access." This is the page where you choose a plan. The owner of Arbitool kindly made available different coupons for my readers and I only have 20 Free coupons for a 12 hours trial. See at the end of the post how you can get one Free coupon or a Discount coupon if you are ready to start right away. Before using your coupon, familiarize yourself with ArbiTool and get your coins ready in your different crypto exchanges because if you want to try it for real, 12 hours is short and there is no second chance. Let's do it for 12 hours now. You will see a "Summary" page. Put your coupon code there and click "Check & use." This will tell you if the code is valid, and if it is, you can proceed and click "Use your code to pay." If you are on the free trial, you will be activated for 12 hours and an email message will confirm that. Other payments go through CoinPayments. Let's get started now with arbitrage trading and I'm going to show you how to use ArbiTool. At the left, you have your "From exchange" and I selected Bittrex, Binance, Poloniex, Cryptopia and Kucoin, (affiliate links), which are exchanges I have accounts on. At the right, that's for your "To exchange" and I used the same ones. You can select just a few "Base currencies" or select them all. For simplicity in this tutorial, I selected only one "Quote currency," which is BTC. Selecting all of them gives you, of course, much more arbitrage opportunities. I kept the "Minimum profit %" at 0.5% and I first tried "ALL" for "Withdraw & deposit status." With this setting, you can start to see some opportunities, but the problem is that if you have a withdraw wallet or a deposit wallet that is not working (red cross), then you can't do arbitrage. 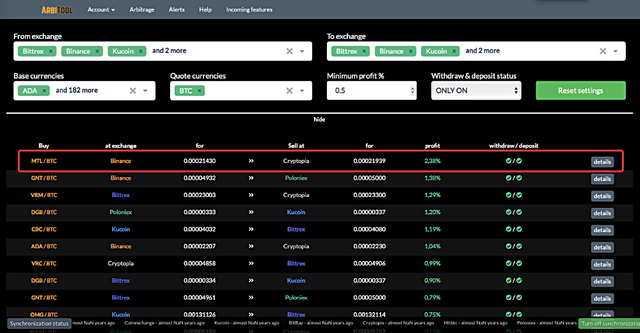 For the first entry, for example you can get a huge profit if you send a particular coin from Cryptopia to a second exchange, which is Bittrex, but the deposit wallet is not working, probably because the coin is delisted or the wallet in maintenance, and consequently you can't take advantage of this arbitrage. You need to have both wallets working to do arbitrage trading, which is two green checks, or one green check and one question mark, which indicates that there is no data in the tool for that wallet. You can still manually check on the exchange to see if the wallet is active or not. 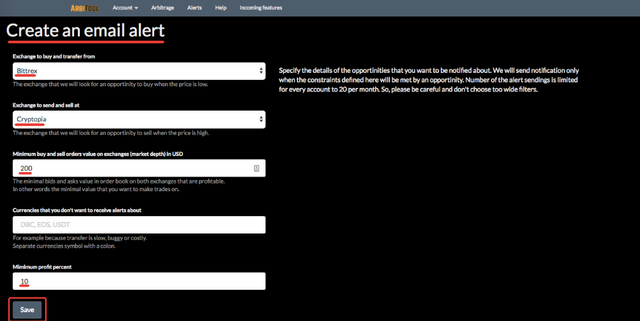 I decided to continue with "Withdraw & deposit status" set to "Only On." We have now a list of possible arbitrage trading opportunities. The value you see are real time, so ten minutes later the profit percentage might have changed. I suggest that we look at the MTL/BTC pair, which has the highest profit here. This window will appear showing you what to do. "Buy MTL/BTC on Binance and sell on Cryptopia." What we need to understand is the calculations. Let's say we want to trade 0.10 BTC on Binance. The first line shows you what the MTL/BTC exchange rate is on Binance, the amount of MTL you will get and the withdrawal fee you will pay. The second line shows the amount of MTL you will receive on Cryptopia, the exchange rate for MLT/BTC and the amount of BTC you will get. It also shows the profit of the arbitrage trading in percent. You can clearly see that we started with 0.10 BTC and we have now 0.10179706 BTC, which is a 1.79% profit. Not that much you may say, but if you do it several times per day it can add up significantly. 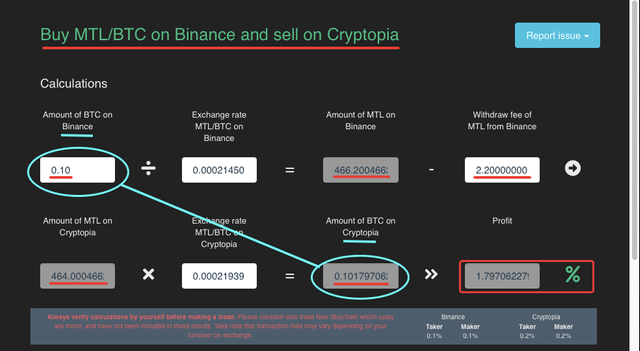 You are also shown the "Market depth" because you need to know the amount of MTL you can buy in Binance and for what rates, and the corresponding amounts of MTL that you can sell in Cryptopia and at what rates. You certainly don't want to buy more MTL than you can sell. There is a button for "Binance" and "Cryptopia" that you can click to do your trade. Now that our Bitcoin is on Cryptopia, let's see what arbitrage opportunity do we have? You can see that there is one opportunity with VRC on Cryptopia. Let's have a look in detail. "Buy VRC/BTC on Cryptopia and sell on Bittrex." Let's trade 0.10 BTC again on Cryptopia. The first line shows you what the VRC/BTC exchange rate is on Cryptopia, the amount of VRC you will get and the withdrawal fee you will pay. 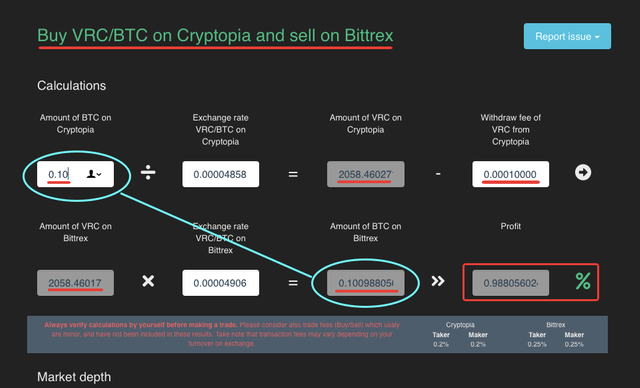 The second line shows the amount of VCR you will receive on Bittrex, the exchange rate for VRC/BTC and the amount of BTC you will get. It also shows the profit of the arbitrage trading in percent. You can clearly see that we started with 0.10 BTC and we have now 0.10098805 BTC, which is a 0.98% profit. Still small, but still a profit. I will show you later in this tutorial how to get much higher profits. We can do it again now from Bittrex. "Buy VRM/BTC on Bittrex and sell on Cryptopia." Let's trade 0.10 BTC like before on Bittrex. 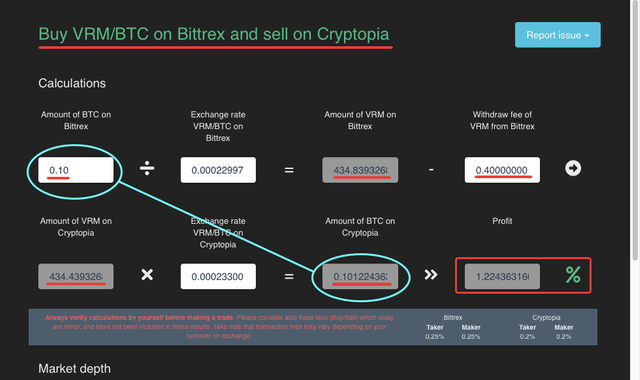 The first line shows you what the VRM/BTC exchange rate is on Bittrex, the amount of VRM you will get and the withdrawal fee you will pay. The second line shows the amount of VCM you will receive on Cryptopia, the exchange rate for VRM/BTC and the amount of BTC you will get. It also shows the profit of the arbitrage trading in percent. You can clearly see that we started with 0.10 BTC and we have now 0.10122436 BTC, which is a 1.22% profit. In this tutorial, we just made three moves and got the following profits. This is assuming that the "Market depth" permitted to do the arbitrage trading for each move at the indicated rates. If we look at how much it is with a Bitcoin calculator, this equals to $24.95. I didn't do these trades because I am just writing this tutorial for you all, results might have been a bit different doing it for real, but I believe that it is pretty close. Only getting $20 would be really good. If you are already excited by what I have just shown you with only 1% to 2% in profit, you are going to get ecstatic seeing the following. The arbitrage trading opportunities are in playing with more exchanges and more quote currencies like I am showing you below. I have now 11 exchanges selected plus 5 quote currencies, which are BTC, ETH, DODGE, USDT and LTC. Now you can see where the big arbitrage opportunities are with profit percentages from 7% to 25%. Let's do it again one more time, just for fun! "Buy LOOM/BTC on Binance and sell on Coinexchange." Let's trade 0.10 BTC one last time on Binance. The first line shows you what the LOOM/BTC exchange rate is on Binance, the amount of LOOM you will get and the withdrawal fee you will pay. 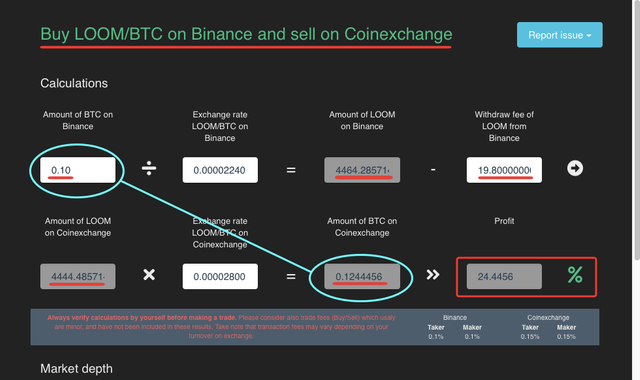 The second line shows the amount of LOOM you will receive on Coinexchange, the exchange rate for LOOM/BTC and the amount of BTC you will get. It also shows the profit of the arbitrage trading in percent. 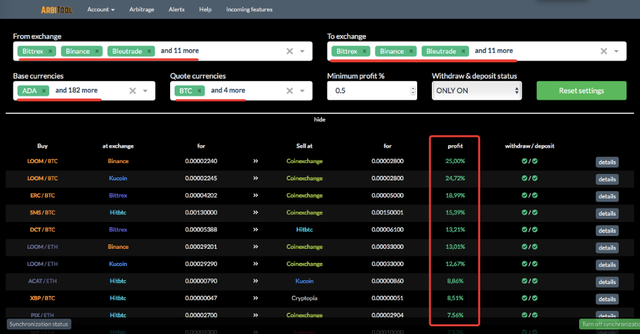 You can clearly see that we started with 0.10 BTC and we have now 0.1244456 BTC, which is a 24.44% profit. This is hypothetical because when we look at the "Market depth," the amount of LOOM on Binance that we can buy at a rate of 0.00002240 LOOM/BTC is only 153 LOOM. There are more rates that you can buy at, but they are slightly more expensive, and this will reduce your profit percentage. When you look at the "Market depth" on Coinexchange, you can see that only 21 LOOM can be sold at that rate of 0.00002800 LOOM/BTC. Then, there are lower rates at which you can sell and that will affect your profit percentage. Looking at the "Market depth" is very important and maybe this arbitrage opportunity can turn into a nightmare if you are not careful. Looking at the different values in the "Market depth," I am confident that we still can find a good amount of BTC to use for buying LOOM and reselling it for a lower, but still outstanding profit percentage. On the same window, you also have the possibility to report issues to ArbiTool, so corrections can be made. ArbiTool also has email alerts that you can take advantage of. You can go to this page from the menu and then click the "Create a new alert." There, you can specify what exchanges you want to see arbitrage opportunities with the minimum buy/sell orders in USD and a minimum profit percentage. Click "Save" and you will see your alert listed. I believe that you can create a maximum of 10 alerts per account. Pretty well, as I received that email this morning. 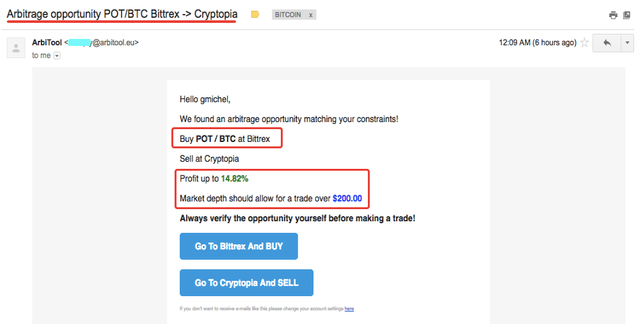 I can buy POT/BTC on Bittrex and sell it on Cryptopia for a 14.82% profit. It also indicates that the market depth should allow for a trade over $200. I can then go directly to Bittrex and Cryptopia from the email, and of course, verify the opportunity before making a trade. It might not be there now as I saw the email 6 hours later. ArbiTool is a new tool, but there is a schedule to add new features for June, July and August, that you can see here. You can see that more exchanges will be added to the tool as well as the possibility to see the average transfer time of a currency from exchange A to B, which is awesome because we have to go fast to take advantage of these arbitrage opportunities. We are very thankful for the following coupon codes provided by ArbiTool. Then, use one of those coupons. Free 12 hours Trial: This is perfect for trying the tool. Private message me on Discord and I will give you a code to use. You can join this server and my Discord ID is "Michel Gerard#4843." I only have 20 coupon codes and I want to make sure that only people serious about trying ArbiTool get one. Buy the yearly package full price and you will get lifetime access. Only 1 coupon available. 30% Discount: Buy 1 year access and get a 30% discount. Only 2 coupons available. Contact me on Discord. 20% Discount: Buy 6 months and get a 20% discount. Only 5 coupons available. Contact me on Discord. Buy 1 month and get a 15% discount. Unlimited number of coupons, but validity is up to 2018-08-25. I hope that you enjoyed this tutorial, that it is helpful to understand more about arbitrage trading, and that you are as excited as I am about ArbiTool. I will answer questions you may have in the comments below. Would you upvote this post and follow me for more because this will encourage me to write more posts about trading tools like this one? You may prefer to go to my Steemit Posts Directory. The most important votes you can make on Steem are for Witnesses. The top 20 witnesses can influence the addition or removal of features in future Steem hard forks. Read my post: What is a Steem Witness, How to Vote and Why? Would you please vote for jerrybanfield as a witness or set jerrybanfield as a proxy to handle all witness votes because I believe he can contribute to make Steem a better place? Very interesting platform, thanks for sharing! I am glad this is useful for you @jo3potato. Great write-up of a tool I never knew existed. While the appeal of a quick buck is always fun, this arbitrage tool looks to be pretty well built & designed, as well. With a bit more user stories + performance data I wouldn't be surprised if this gained a significant following. Thank you very much @awesomefaic for your kind comment. I discovered this tool recently myself and I intend to use it and see where it's going. Sweet, I am sure that I have missed the free coupons. I would definitely be interested in any future coupons you get. You haven't missed anything yet @anarcist69. I still have trial coupons for those who are serious wanting to try this tool. You have introduced very useful tools for the cryptocurrency. ArbiTool is easy to apply and all we should try this for better earn. I am going to check it. Thanks for sharing. I am glad that it is useful for you @sayemsonai. Thank you for commenting. I am glad you like it. Thank you for the upvote @mjtravel. Wow.. such detailed and informative article. This tool looks like very useful. great article. Thank you very much for your feedback @nids209. I am glad you like it @mahadihasanzim. I never knew we could do Arbitrage in crypto trading too. I am saving this post for future reference. Thanks again for the useful information. I am glad this post is useful for you @mrgeeksunited. Can't believe such a tool exists and the arbitrage margins are still so wide! Maybe it has to do with how not all exchanges accept everybody (like geographic restrictions etc) Do you arbitrage often? Thank you for your comment @zhuwa. I just discovered this tool, so now I am going to do arbitrage trading more. You got a 2.85% upvote from @postpromoter courtesy of @gmichelbkk!